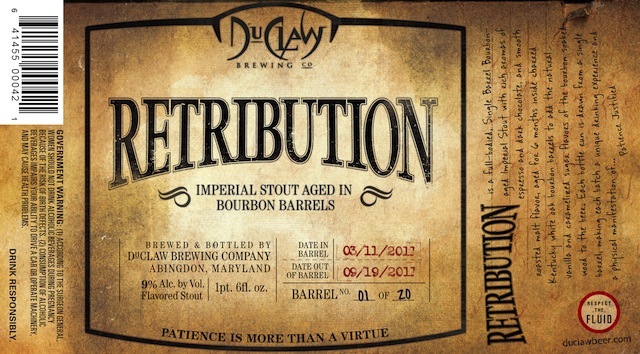 On tap at Curley’s Corner, sweetly creamed bourbon vanilla-glazed dark chocolate syruping drapes brown-sugared dried fruiting and mild oak-charred hop bittering. Massive molasses-sapped mocha surge allows cocoa nibs, ground coffee, toasted coconut and pecan illusions to surface. Though its bittersweet strawberry adjunct gets buried beneath the syrupy black chocolate milking, creamy caramel-burnt dark cocoa subsidy and tertiary coffee roast, rich sweet stout never fails to arouse tastebuds as a fine dessert treat. Milk Dud-like midst picks up modest vanilla, molasses and nutty nougat nuances to champion its mighty mocha mass above mild hop-charred bittering. Large maple-sugared blueberry contingent sweetens above Cascade-hopped Meyer lemon tang, pale wheat malting and clover-honeyed Graham Cracker spine. Lacquered blueberry syruping thickens over time.